As you may be aware, Valentine's Day is rapidly approaching. 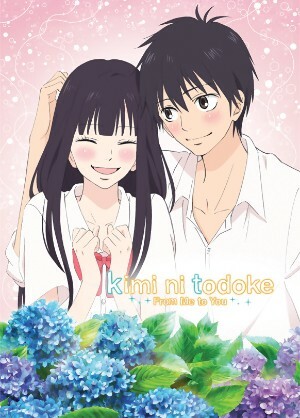 As that gives me a convenient theme for this week, allow me to recommend a few well done anime romances. If you're not in the mood to watch and/or read anything romantic around now, come back tomorrow for a non-romance-related webcomic recommendation. Without further ado: to the bullet-points! 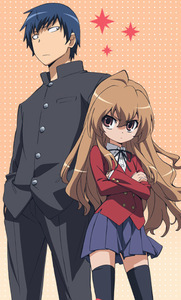 Toradora!-- This show is one of the best romantic comedies and/or dramas I have ever seen. At the start, the characters seem pretty archetypical and the he premise is simple (and cliche) enough: two odd teenagers have crushes on each others' best friends and decide to help each other out. As the show progresses, however, the characters are shown to be far more complex then they first appear, with issues and relationships much more complicated then you may initially guess. This show takes typical romantic comedy anime archetypes and fleshes them out into fully developed characters. In addition, Toradora! pulls it off with a minimum of male-gazey fanservice, proving that you can create an anime series with all of the strengths of the seinen romantic comedy and none of the weaknesses. There is a reason this show earned the extremely rare "A" rating from Anime News Network's reviewer. This series is licensed in North America by NIS America and available on DVD in two sets. The first six episodes are available for viewing on Crunchyroll, with the remaining episodes available for paying users. a romance set in late Victorian England (the 1890's, to be precise). This is the story of a maid and a member of the gentry who fall in love and the stratified nature of Victorian society. If you're sick of "Victorian-ish" settings and want some historical accuracy in your romance, look no further! 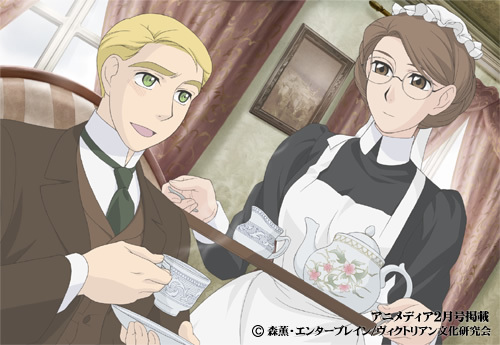 Based on the manga series by the talented (seriously, check out her cross-hatching technique) Kaoru Mori, a self-proclaimed Anglophile, historical consultants were used in the making of this series and the characters act the way you would expect people in their positions to act rather. The series is often quiet and reserved, but it can pack plenty of drama when it's called for. Split into two seasons, both are available in North America from Nozomi Entertainment and Right Stuf and Nozomi Entertainment has made the first two episodes available to view on YouTube. this English title is actually less unwieldy than the Japanese title. This show was hands down my favorite of the 2012 fall anime season. "Chuunibyou" is a condition many people develop around 8th grade in which they delude themselves into believing that they're super special, whether by having special powers or remembering past lives or whatever. Yuta has left his chuunibyou days behind him, but his classmate Rikka is neck deep in chuunibyou of her own and has attached herself to him. This show is sweet and hilarious and even manages to fit in some (completely make-believe) action scenes. The animation is gorgeous (no surprise considering the studio) and the comedic timing is wonderful. Like Toradora, Chunibyo explores and develops its characters beyond expectation and like Toradora, it manages to do so with little to no fanservice shots. It even manages to completely avoid a "harem" situation despite the many female characters in the cast, in part by expanding the role of Yuta's best friend. The focus for the first half of the series is on comedy and character introduction and it's enjoyable to watch, but the show gets into full swing in the second and focuses more on character and the central relationship while exploring why someone might dive into fantasy, why fantasy is important, and what "normal" is. 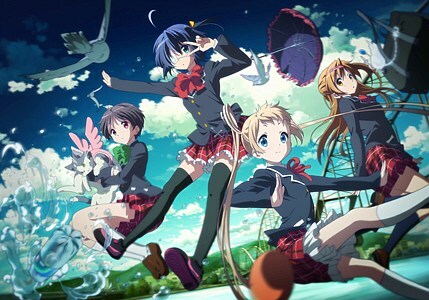 This series has been licensed in North America by Sentai Filmworks and it's planned to come out on DVD later this year, but for now it can be viewed on The Anime Network (ignore their series description, it doesn't know what it's talking about), with the first episode available for free users. If you enjoy the humor and characters in the first episode, I really would suggest paying for one month's subscription, watching the show, and then canceling the subscription. This show is definitely worth the seven dollar fee. who falls in love with a "refreshing" popular boy. The main character is adorable (everyone is terrified of her and she's completely oblivious) and the love interest is popular because he's super friendly and their friends are fantastic and basically this show is for when you want something adorable and sweet and heartwarming. Like Toradora, it is licensed in North America by NIS America and DVD sets are available, though only the relatively expensive Premium sets with lots of extras. Also like Toradora, the first six episodes are available for viewing for free on Crunchyroll with the rest of the series available to premium members. My Little Monster-- The story of a girl who just wants to be left alone so she can study and the boy who needs to be socialized and won't leave her alone. This romantic comedy is hilarious and fun and funny and absolutely worth watching. Why is it only an "honorable mention," then? Simple: at this point, it only feels half finished. Hopefully there will be a second season to wrap things up but as it stands, it's a highly enjoyable series without a satisfactory conclusion. All of this series is available to watch for free on Crunchyroll.